I top a plethora of my meals with various garnishments and flavorings because that’s just how I am. Sure I get by with doing simple dishes without any flavor addition when I’m in a rush, but most of the time I try to keep things interesting by adding some sort of adornment. You know us foodies, and don’t kid yourself, because if you’re a true foodie you will go out of your way to make things a little more extravagant and more of an experience. Typical garnishments like fresh chopped herbs, lemon zest, fresh grated garlic, avocado, fried eggs, poached eggs, heck maybe if you’re feeling fancy you’ll slather some caviar on there. These are all good but most recently my love has been pickled red onions. Making another batch of these was an easy decision for me because the slicing was the perfect thing to break my brand new knife in. It was recently my birthday and among the number of things that I received, my absolute favorite is my new Shun chefs knife. I’m just so mesmerized by the look of the poured steel and the way it feels in my hand, that I had to find a way to work it into one of my shots. So maybe it wasn’t really the pickled onions I wanted to show off, rather it was my brand new knife. Vibrant, bright pink ribbons give a beautiful presentation and wonderful flavor to a variety of dishes. I see a lot of people using them on things like tacos (with cauliflower tortillas of course) or salty or rich meats like carnitas. While I agree they’re great for those things and I find myself making them when I make my carnitas but I don’ think that they’re limited to that at all. You can pretty much put them on top of anything. The plus side is they make everything look good like any good garnishment should. 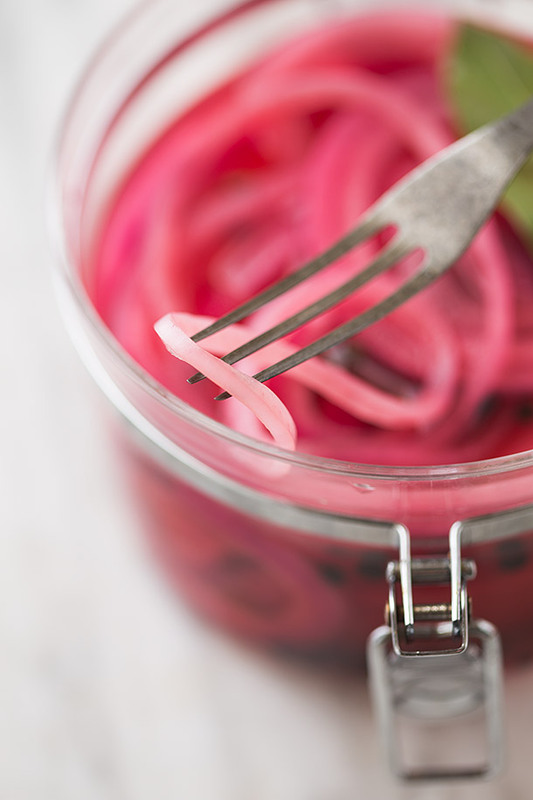 Since the process of making pickled red onions is fairly easy and leaves with you something that you can kind of just grab out of a jar and put on top of something, without having to chop anything, can make it for a nice quick addition to something. It only becomes complicated to make when your geriatric dog starts casually relieving themselves all over the house. All of course when I was trying to enjoy the use of my new chef’s knife when I noticed it, so that was nice and refreshing. At least I got the pickled onions done, but I wasn’t too enticed about eating anytime soon. Good thing they have to sit for a little while before they’re ready. 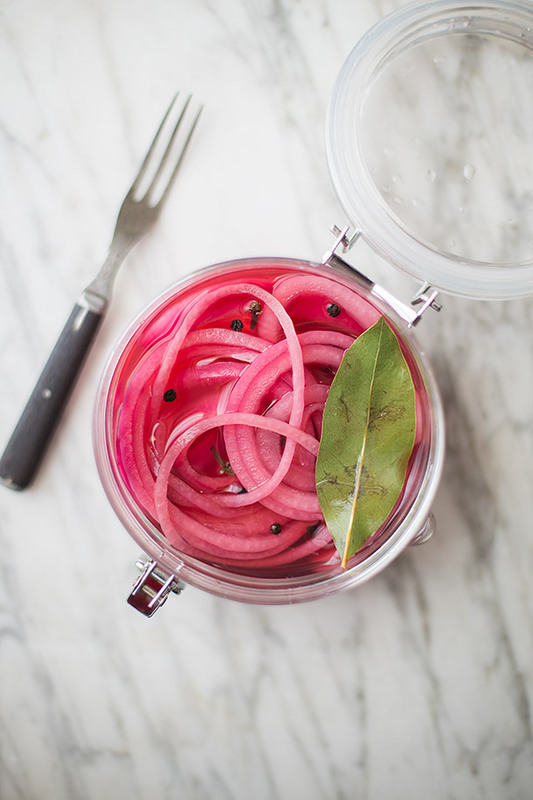 A fast and easy recipe for pickled red onions. 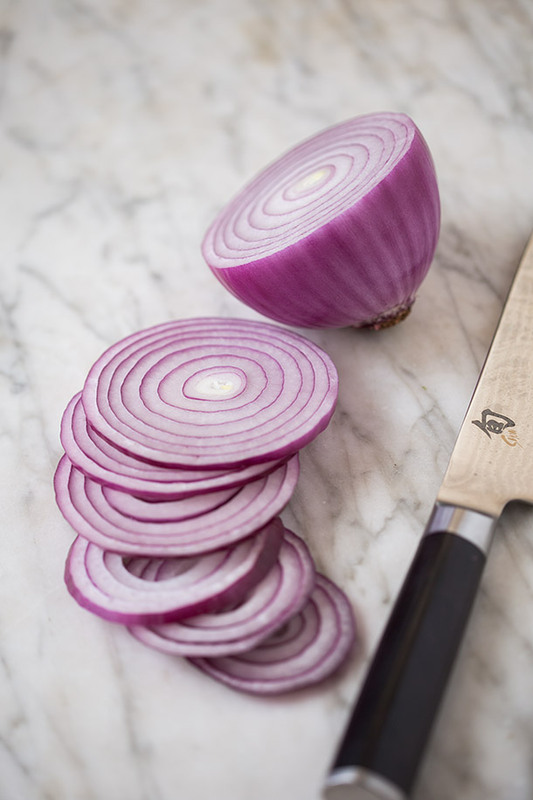 Slice the onion into ¼ inch rounds, place in a metal sieve and slowly pour boiling water over them to par blanch them (3 cups or more of boiling water). In a glass or plastic container, (any container works as long as the onions will fit in and be mostly submersed in the vinegar) pour in the vinegar and stir in salt and optional coconut sugar until dissolved. 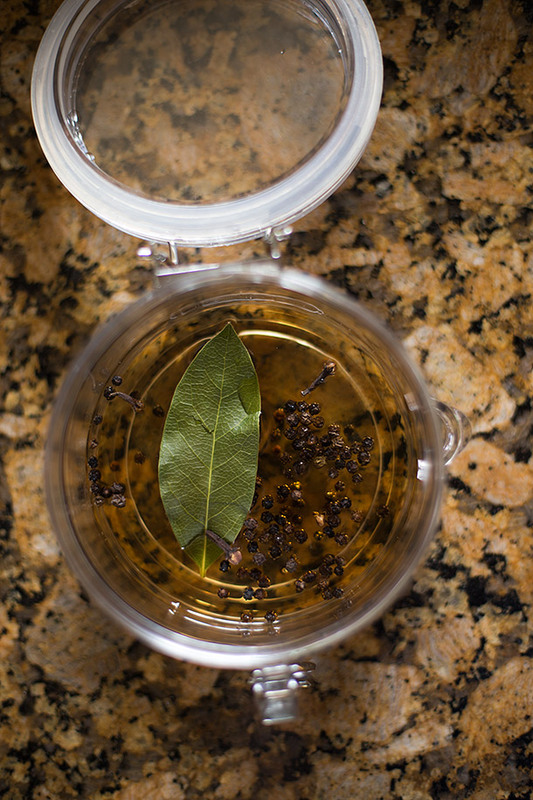 Add bay leaf, peppercorns, cloves, and par-blanched red onion to the vinegar mixture, cover, and let them sit for at least 1 hour but preferably overnight. Store in the fridge for up to 2 weeks. I've noticed that let tin them sit in the vinegar mixture for 2days or longer yields the best flavored and colored results. If you want those vibrant and bright pink rings then you'll want to go for 2 days. These can be made several days ahead of time so you can just make them and then store them for whenever you want to use them or make them a few days ahead of a party or get together. Par-blanching note: We just need to par blanch the onions so there is no need to pour 4 quarts of boiling water on these, we just want a steady stream of hot water to blanch them for a few seconds. I received a Shun for Christmas. It is absolutely amazing! I’m obsessed with how sharp it is, and how clean it cuts. 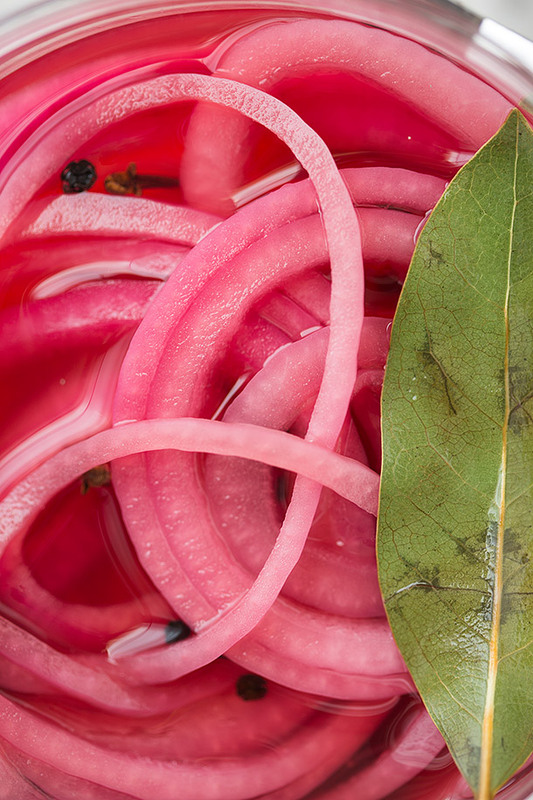 I’ve never made pickled red onions before but those look super tasty and easy I’m gonna give it a try. Congratulations on your knife it looks absoulotly gorgeous in the pictures! After 2 days should they be removed from the vinegar brine. How long will they keep? I leave mine in the vinegar brine and have kept them in the fridge for 2 weeks and they were fine. The only thing I’ve noticed is that the longer they sit the more acidic they become. They are best within the first 1-4 days in my opinion. Also you letting them sit for 2 days isn’t required you could let them simply sit for a few hours in the vinegar brine if you don’t want to wait, they’re just better after 1-2 days. I’m on a candida diet so the only vinegar I can have is Apple Cider Vinegar. Do you think that would alter the final product? Thoughts?